Another tough decision as to classifying this as shoe pedestal or High Heel Black Chrome Riser at Karen Millen. What term would you use in an internet or FixturesCloseUp seach for the fixture … for both exist as keywords. For now I will stick with Riser, but point out that the black chrome execution matches actual Pedestals and Pliths throughout the Karen Miller store. Together they create an integrated look and theme, and also insure that crass fixtures alone do not fight for attention. That is left to the merchandise. 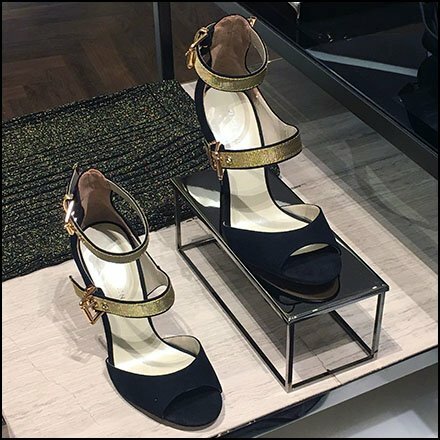 This High Heel Black Chrome Riser at Karen Millen seen at the Manahattan Store.